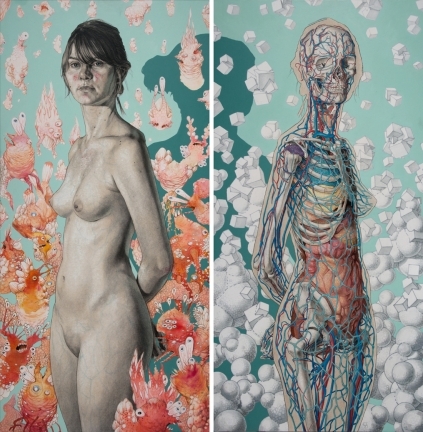 The human figure has been central in Michael Reedy’s paintings and drawings for the last twenty years. 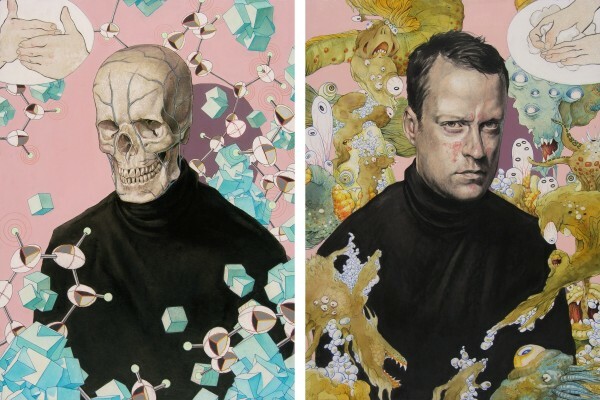 His most recent works explore themes of life, death, and the human condition. This renewed curiosity in the physical limits of the body, and its ultimate failing (both outwardly and inwardly), has been paired with his prior interests long rooted in depictions of the body that fall outside the canon of art history (medical imaging and cartooning). 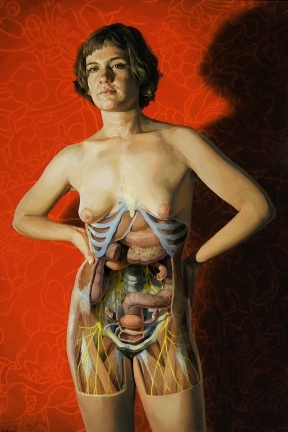 Here, the ongoing references to anatomical illustration, and its benign approach to depicting pain and death, and cartooning serve to both underscore the comedic tragedy of physical existence and the frailties that increasingly define our sense of self as we age. In each instance, the unsettling presence of the open body presents complex questions of gender, pleasure, pain, interpretation, and reception, and results in works infused with a sense of scientific aura, moral lesson, and morbid entertainment. Consequently, the viewer is seduced into disregarding the boundaries between interior and exterior, between looking and feeling, and between the real and the pictured body. 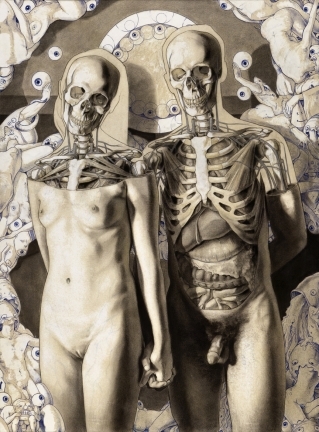 Michael Reedy is currently an Assistant Professor in Drawing at Eastern Michigan University. 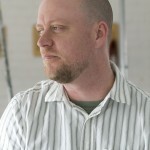 He received his MFA in painting from Northern Illinois University in 2000 and his BA from North Central College in 1996. 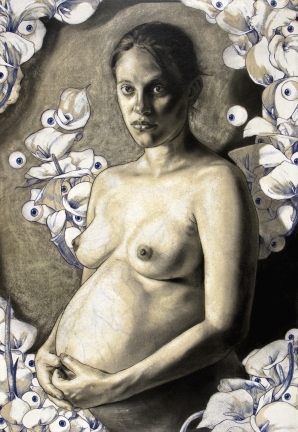 His work has been included in over 100 national and international exhibitions and can be viewed in numerous private and institutional collections, including Minot State University, Clatsop Community College, Shippensburg University, and the Hoffman Trust National Collection in association with the San Diego Art Institute. 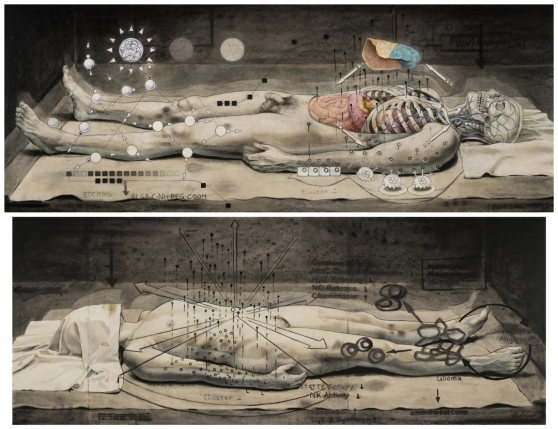 Notable recent creative activities include exhibiting work in Drawing Discourse: An Exhibition of Contemporary Drawing at the University of North Carolina, the Midwest Drawing Invitational at the University of Saint Francis, and a recent solo exhibition (Expulsion) at The International Museum of Surgical Science in Chicago, IL. In addition, Michael was also the subject of a recent article in the Winter 2013 / Volume 27 issue of Hi-Fructose art magazine.